I’m not saying I’m an NPR nerd, but when I heard that a contributor to “This American Life” will be at Film Streams at the Ruth Sokolof Theater, I swooned like an antebellum southern belle. Medora, a movie I have wanted to see for a while about a small town basketball team, will screen on Thursday, Jan 9 at 7 pm, with a Q&A with director Davy Rothbart, who will get at least one question about whether Ira Glass is really as charming and brilliant in real life as I want him to be. For tickets, hit up filmstreams.org. And while you’re there, find the link to vote for the 2014 “Members Select” repertory movie that the theater will show early next year. I’m not telling you what to vote for, only that if you don’t vote for The Princess Bride you did it wrong. Dwayne “The Rock” Johnson has just signed on to do San Andreas, an action film about a major earthquake in California. The cause of the earthquake? The Rock finally gets so big he explodes. You have to love the Coen Brothers. You do; it’s an obscure law passed a few years ago. While promoting Inside Llewyn Davis, the pair threw out some ideas they’re toying with for the next movie in their insanely eclectic careers. They mentioned possibly something about an opera singer or something set in ancient Rome. Not satisfied with being disliked on the basketball court, Lebron James is ready to add actual critics to his list of critics. He just signed on to star in Ballers, in which he will presumably play a baller. 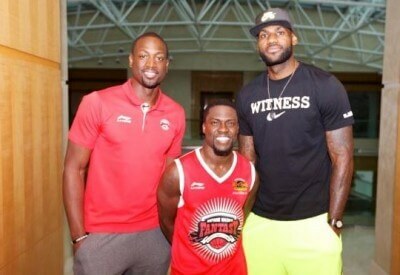 Kevin Hart, who loves basketball, is co-writing and co-starring. I’m just going to go out on a limb and guess there’s going to be a few jokes about height involved.